The Kanyakumari Kumari Amman Devi is considered as a Shakti peetha. The temple is among one the 108 Shakthi peethas in the world. The temple was founded by Lord Parasurama and is the first Durga Temple. The temple’s Kalabhairava is known as Nimish and the Shakti is called Sarvani. The Kanyakumari Kumari Amman Devi temple is located in Tamil Nadu. Kanyakumari formerly known as Cape Comorin is at the southernmost end of the Indian peninsula. Thiruvananthapuram, Nagercoil and the capital of Kanyakumari district are the nearest major cities. 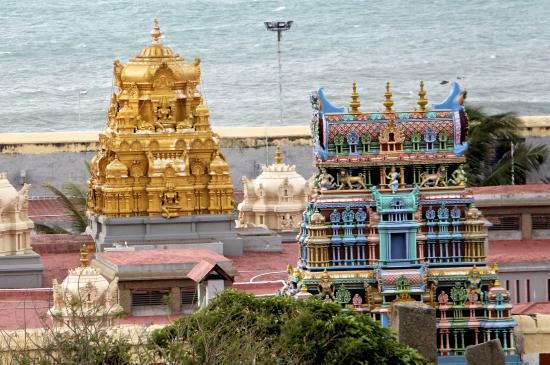 The name, Kanyakumari was gotten from the Kanyakumari Temple located at the shore on the convergence of the Arabian Sea, Indian Ocean, and the Bengal Bay. The name Kanyakumari represents Kanya meaning virgin and Kumari meaning girl. The virgin goddess, Devi Kanya Kumari is an aspect of Parvarthy. Devi Kanya Kumari is also known as Kumari Amman, Kanya Devi and Devi Kumari. The Kanyakumari Amman Devi Temple has been discussed in the Sangam age work Manimekalai and Puranaanooru and the ancient scriptures Mahabharata, Ramayana. The Kumari Amman temple is over 3000 years old. It is one of the godly homes of goddess Shakti. It is said that the corpse of goddess Shakti was dispersed into 51 parts throughout the subcontinents of India. The site of the fall for each of the parts is now a holy place of worship for Shakti followers and worshippers. The back of the goddess is said to have fallen in Kanyakumari. So a temple was built on the site of worship. The worship of Kanya Kumari has been dated to the Vedic times. As Devi is the goddess of Sanyasa, Swami Vivekananda came to appeal for Devi’s blessing in December 1892 as guided by his Guru Sri Ramakrishna Paramahamsa. Swami Mirmalananda and Swami Brahmananda were also worshippers of Devi Kanyakumari and disciplines of Sri Ramakrishna Paramahamsa. A few girls were brought from different parts of Kerala to worship Bahagavathy by Swami Nirmalananda in the year 1935. In 1948, seven of the girls later went on to become the members of the first batch of Nuns of a Hindu nunnery known as Sarada Ashrama. The Vaisakha festival: This is a festival of 10 days which is usually celebrated in the Tamil month of Vaikasi. This festival takes place between the months of May and June. The pictures of Devi are displayed around town in the morning and evening. The Thoni Ezhunellathu occurs on the 9th day in which the deity will be encircled in a boat on the western side of the water. The Chitra Pournima festival: This festival celebration takes place in May on the day of a full moon. The Kalabham festival: This festival takes place in the Tamil month of Aadi (between the months of July and August). On the last Friday of the Tamil month, the deity is veiled with sandal paste. The Navarathri festival: This festival lasts for 9 days and is usually celebrated in the months of September and October. Various music artists present their skills to the Devi deity at the Navarathri Mandapam. An image of Devi is worshipped for the whole period of Navaranthri. And on the Vijaya Dasami which is the 10th day of the festival, the annihilation of Banasura is commemorated. A picture of the deity is placed on a silver horse and is taken to Mahadhanapuram (the place where Banasura was killed). The temple is always open in the mornings from 6:00 am to 11:00 am and in the evenings from 4:00 pm to 8:00 pm.